Rice cookers are a popular kitchen appliance and it is no surprise why! Offering a convenient way to cook rice, they are energy efficient and take all the hard work out of cooking. With their growing popularity, choosing the best product out of so many options can be confusing. To help make that choice quickly and easily, we have put together this rice cooker buying guide. All rice cookers are electric and can be divided into one of four types depending on the amount of features and functions it has. The four main types of rice cookers include standard, automatic, programmable and multi-purpose rice cookers. Here is a breakdown of each for you to compare. Standard On/Off Rice Cookers: These entry level cookers are easy to use and cost effective. Used to cook white or brown rice by simply switching it on and off, they are ideal for those looking for a simple good value cooker. 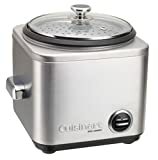 Automatic Rice Cookers: Automatic rice cookers include a keep-warm mode. This is particularly useful for busier homes as they automatically switch from cook to warming once the rice is ready. Make it possible to keep food warm until dinner time with no hassle. Programmable Rice Cookers: Programmable rice cookers have a host of programmable settings to make cooking different kinds of rice easily. Able to make rice at the consistency needed for different recipes such as sushi or soup, they are a popular kitchen helper. Multi-Purpose Rice Cookers: These rice cookers have a host of added features and functions and can do a variety of tasks besides cooking rice. From sauteing to steaming, multi-purpose rice cookers offer a lot more appliance for your money. 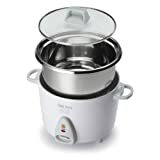 Cleaning: One of the most talked about factors of a rice cooker is how easy it is to clean. Models that are easier to clean get much better online reviews and result in better buyer satisfaction. Rice cookers with non-stick or stick-proof pots are reviewed best in this regard and are worth considering. Operation: Rice cookers that are easy to use are rated much higher by their purchasers. Programmable micro rice cookers, that cook perfect rice at a touch of a button and can handle a variety of rices types are reviewed much better than those that don’t. Capacity: Buyers who chose rice cookers based on their cooking needs are a lot more satisfied with their products. 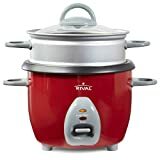 Noting that the right capacity cookers allow them to cook enough rice for their dinners as well as eliminating waste and therefore get much more use out of their product. Build: For frequent users the build and look of their rice cookers are a top reviewing point. This is because more often than not their rice cooker is left on display on their kitchen counter for guests to see. If this is an important factor for you, consider the available counter top space you have as well as your design preference and choose your rice cooker accordingly. The first thing to consider when choosing a rice cooker is how many people, on average, will you be cooking for. This will determine what size, or capacity, rice cooker you will choose. 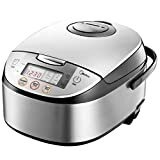 For smaller families 3-5 cup cookers are efficient, while for larger families or chefs who like to entertain a larger capacity 6 - 10 cup rice cooker will prove more convenient. A good rice cooker should be easy to use and include an auto-shut off. Another consideration is where you will be using and storing your rice cooker. If you are short of counter space, choosing a smaller rice cooker may be more convenient for you. If space is not an issue, a larger cooker with more functions will give you more variability. Rice cooker pots are either stainless steel or non stick. Stainless steel pots are durable and require less maintenance while non-stick pots are much easier to clean. 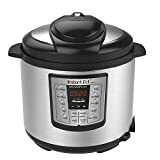 High-end rice cookers that use microprocessors (often referred to as fuzzy technology) will automatically adjust temperatures and times to ensure rice is cooked perfectly every time. 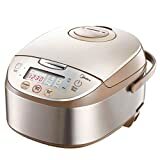 Rice cooker features that are worth considering include: a dew collector that gathers steam droplets and prevents them from wetting the contents of the pot, a cool-touch lid to make the cooker easier to handle, and a steaming tray which is placed into the rice cooker allowing you to steam vegetables for your meal. Zojirushi: Zojirushi Corporation was launched more than 90 years ago and is on the forefront of kitchen appliance industry manufacturing appliances aimed to bring comfort and ease to consumers.